Kaltenberg holds its own Knight’s Tournament (Ritterturnier) every year in southern Germany. The tournament is one of the most famous in the world. 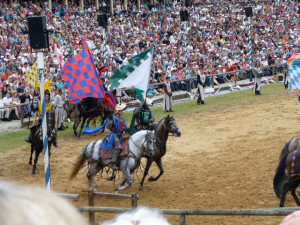 All the knights that compete often perform in movies as knights in battle, in a jousting tournament, or in some other part of a medieval film. The festival is conducted for 3 weekends in the summer, normally in July. For 2016, the July weekend dates are 15-17, 22-24, and 29-31. During those three weekends, a story is told in which you can join the journey. 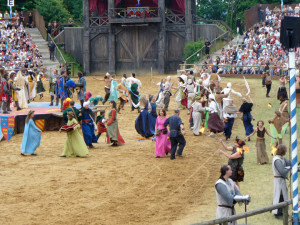 When you arrive on the grounds, you will find a different scenario than one in a United States medieval festival. Those attending the festivities often dress in the clothing of medieval times, but not in costumes from other eras.. Except for tourists that aren’t dressed in medieval costume, the dress of all who are part of the story is consistent with the time period. Take a close look at the colorful knight’s costumes, their assistants, and those of the additional parties. The arena decor for the event is spectacular and those costumed for the parades throughout the day takes the tourist back to life centuries ago. The facilities are up to date and modern for restrooms, eating establishments, and sound systems. The Germans believe in close adherence to excellence in all they do, which you will see not only in the arena, but also in the streets of the walled fort or city. Jugglers, pantomime artists, jokesters, and on-the-street acts keep the tension building as the weeks lead up to the final weekend and feast for the King and his Queen. Drink in the scenery, setting, and sounds. Period music performed by superb musicians, excellent German food, other cuisine, and the Germanic language will attract your attention. Shouts of vendors, horses neighing, donkeys braying, and chicken and roosters clucking and crowing integrate together in one joyous sound of a festival mood. You can’t experience all of the acts, plays, music, art, food, and other parts of the festival in one day. Stay in a place near the Ritterturnier so that you can return and enjoy the continuing saga of the King and Queen and their enemies. Finally, take the time to explore the nooks and crannies of this medieval experience and find a souvenir worthy of your hard-earned money. You won’t want to forget the adventure. When you review pictures or recall the images from your visit, you can honestly remember the authentic life-recreation of a time when life was simpler. The experience will be a tremendous event that is indelibly planted in your mind. Enjoy it!